A favorite bedtime book is brought to life with this colorful teether activity toy. Featuring a friendly and familiar bunny face and a clip on J-hook for easy transport, this activity toy is easy to store and machine washable. Say hello to Baby Stella's little cousin, Wee Baby Stella! She's a soft and cuddly 12-inch baby doll with the same lifelike qualities as her bigger Baby Stella cousin. She comes with a pacifier that attaches magnetically to her mouth. Available in a variety of skin tones. 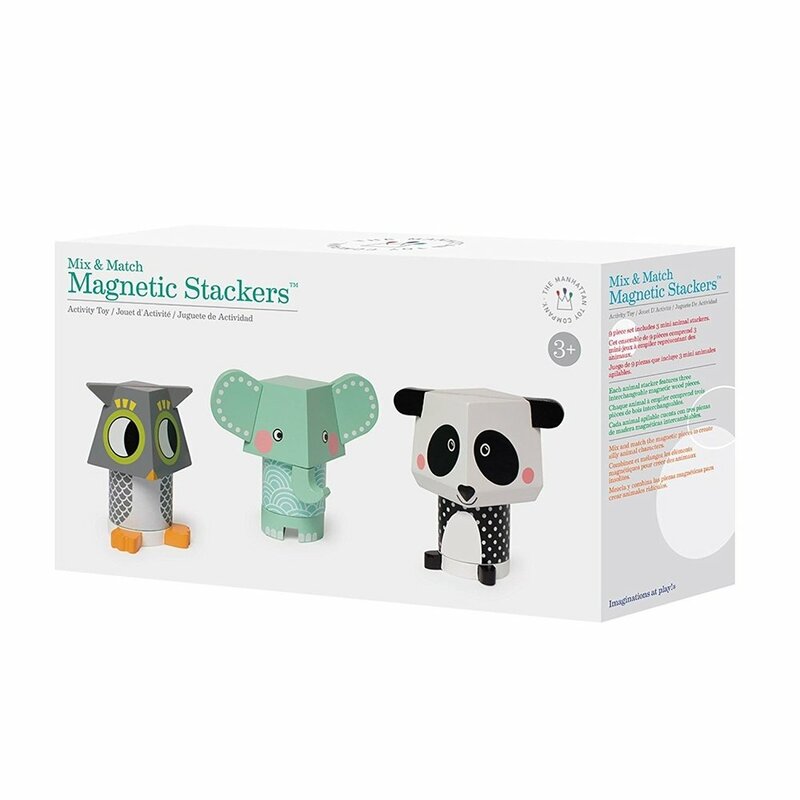 This magnetized 9-piece wooden stacking block set features 3 colorful, stacking block characters. A Panda head with elephant feet? an owl body with a elephant head? Why not! Each animal character is made of three brightly colored wood pieces with engaging facial expressions. From the creators of the New York Times bestseller Dragons Love Tacos comes a rollicking, rhyme-tastic, interactive high five competition—starring YOU! Discover the lost art of the high five and improve your slapping skills just in time for the annual high five contest! From hand-limbering stretches to lessons on five-ing with finesse, readers are guided through a series of interactive challenges, each goofier than the next. Just in! We have new 100% cotton Old Town tees for the kids! These custom-made shirts come in white and navy, and available in toddler and youth sizes. Great way to show hometown pride or as a souvenir gift. Available only at Hooray for Books! 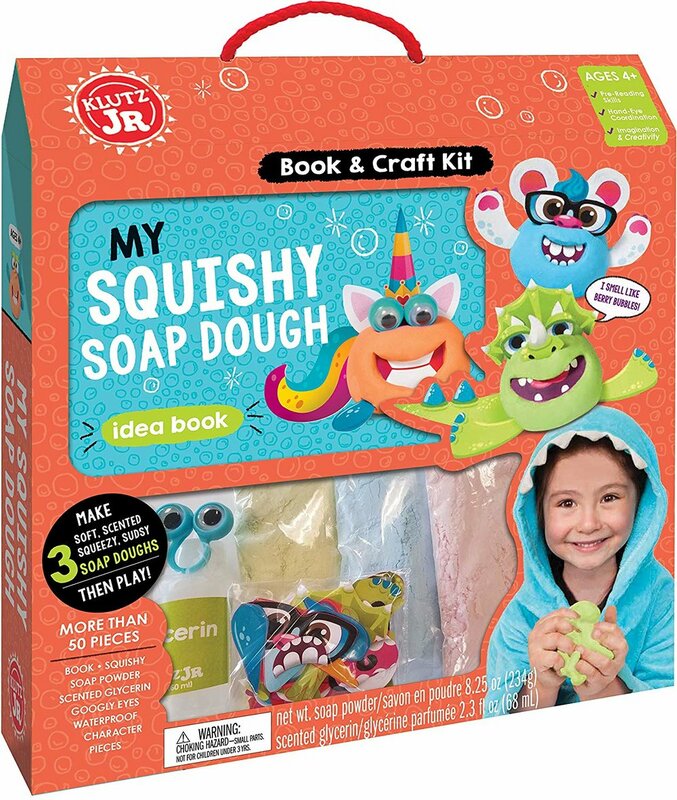 Make bath time fun that Squishes and stretches! Simply mix the Glycerin and one of the 3 included soap powders, and then mold and shape the soap dough just like clay! Using the water-safe plastic body parts and googly eyes, bring your soap dough to life by molding it into friends like a Unicorn, a dinosaur, a Narwhal, and more. Our Klutz collection is fully stocked! Young Scientists create sticky ice, remove gas from soda, and make flower change colors. The kit finishes with Young Scientists using test tubes, filter paper, and funnel to separate mixture of materials and making an explosion that will excite any budding scientist. Other kits available. Find a variety of treasured and timeless classic books, like Heidi and Pinocchio. With the small size and great price, you won’t have the hard decision of picking out just one! Pax was only a kit when his family was killed and he was rescued by “his boy,” Peter, from abandonment and certain death. Now the war front approaches, and when Peter’s father enlists, Peter has to move in with his grandfather. Far worse than being forced to leave home is the fact that Pax can’t go. Peter obeys his stern father and agrees to release Pax back into the wild. But before Peter makes it through even one night under his grandfather’s roof, regret and duty spur him to action; he sneaks out into the night, determined to find his beloved friend. This is the story of Peter, Pax, and their independent struggles to return to each other in the face of war. 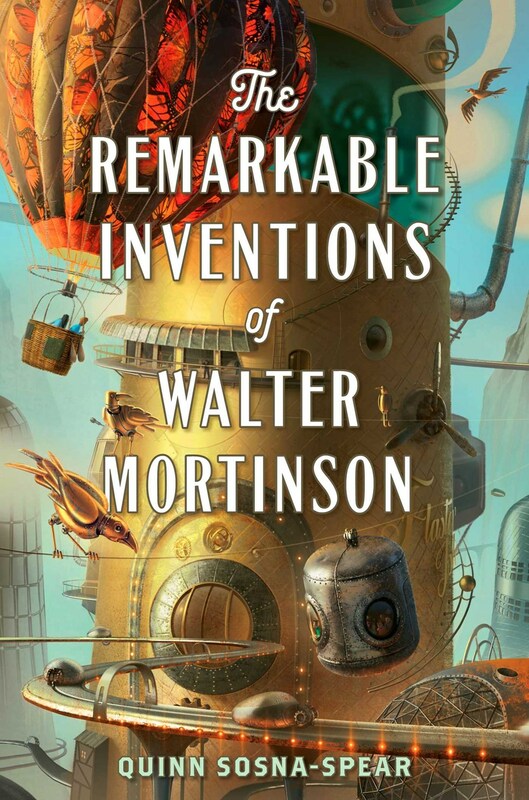 In the humdrum town of Moormouth, Walter Mortinson’s unusual inventions cause nothing but trouble. After one of his contraptions throws the town into chaos, Walter’s mother demands he cut the nonsense and join the family mortuary business. When a letter arrives by unusual means offering Walter an apprenticeship, it isn’t long before Walter decides to flee Moormouth to meet his destiny. Walter runs away in the family hearse along with Cordelia, the moody girl next door with one eye and plenty of secrets. Together they journey through a strange landscape of fish-people, giantess miners, and hypnotized honeybees in an adventure that will not only reveal the truth about Walter’s past, but direct his future. As a young nation begins to take shape, Alexander Hamilton and Elizabeth Schuyler are on top of the world. They’re the toast of the town, keeping New York City buzzing with tales of their lavish parties, of Eliza’s legendary wit, and of Alex’s brilliant legal mind. But new additions to Alex & Eliza’s little family mean change is afoot in the Hamilton household. When they agree to take in an orphaned teenage girl along with Eliza’s oldest brother, John Schuyler, Eliza can’t help but attempt a match. It’s not long before sparks start to fly…if only Eliza can keep herself from interfering too much in the course of true love. After all, she and Alex have an arrival of their own to plan for, though Alex’s latest case brings a perilous threat that may destroy everything. This is National Book Award finalist and New York Times best seller Jason Reynolds' fiercely stunning novel that takes place in 60 potent seconds - the time it takes a kid to decide whether or not he's going to murder the guy who killed his brother. The whole long way down, the elevator stops on each floor, and someone connected to his brother gets on to give Will a piece to a bigger story than the one he thinks he knows. Told in short, fierce staccato narrative verse, this is a fast and furious, dazzlingly brilliant look at teenage gun violence, as could be told only by Jason Reynolds. When Nadya prays to the gods, they listen, and magic flows through her veins. But when the Travanian High Prince, and his army invade the monastery she is hiding in, instead of saving her people, Nadya is forced to flee the only home she’s ever known, leaving it in flames behind her, and vengeance in her heart. As night falls, she chooses to defy her gods and forge a dangerous alliance with a pair of refugees and their Tranavian blood mage leader. The plan? Assassinate the king and stop the war. But when they discover a nefarious conspiracy that goes beyond their two countries, everything Nadya believes is thrown into question. Nadya must now decide whether to trust the High Prince – her country’s enemy – or the beautiful boy with powers that may ignite something far worse than the war they’re trying to end.